It is sad that India has failed to gather the same momentum in the rooftop solar segment as is the case with ground mounted PV plants. Some of the challenges that the Indian rooftop solar segment faces are cumbersome installation, area requirement, and cost of installation. The cost headache has come down to a great extent and these installations are finally reaching a stage where one can proceed even without subsidies. Coming to the process of installation. Problems such as finding a good installer and getting the installation done also exist in our country. In the west, installers like SolarCity and Sunrun eased the installation process considerably with zero upfront cost, easy installment payments and no headache of further maintenance. Though India still has a long way to go reach that level, the country has made a head start in this direction. Note currently leasing model is not very popular in India. There are many solar developers and installers in India and now few installers have also entered the leasing space. Few of them are Hero Future Energy, SolarTown Energy Solutions, First Green and SunAlpha Energy. It is true that it might be difficult for an individual whose owner to initiate the process himself and install the rooftop solar system on his own. In such cases leasing is an attractive option. It also makes much sense for people who want to invest in solar but do not want to park in large funds. Other advantages of solar leasing include low-cost financing, multiple financing options, no headache of maintenance or repairs, and above all low bill amounts. Some of these contacts also give the option to buy at the end of the contractual period. With solar leasing, customers can save about 10-15% of their electric bills. Given, all these advantages of solar leasing many solar developers of Gujarat have petitioned Gujarat’s power regulator to change its solar policy. 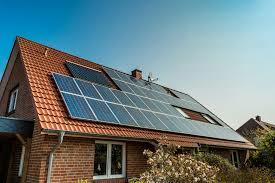 The Gujarat solar policy currently allows only house owners to install rooftop solar panels on their own. While cost is not a major constraint anymore, common man might not be solar educated enough to research about the solar components to be installed and might even drop the idea. Gujarat was the trailblazer of solar energy growth in India and as such many solar developers have come forward and raised this issue to allow leasing of solar in the sunny state. You can read the entire story on Indiatimes. i) Hero Future Energy – Hero Future Energy has a presence in nearly ten states of India with an impressive operating asset base. The company has plans to implement 100-200 MW by 2018-19 in rooftop solar segment. ii) SunAlpha Energy – SunAlpha Energy is a sister concern of Singapore’s Solar Horizon Pte. Ltd. SunAlpha uses first-grade engineering and tier-1 material for construction of a solar plant. Its management team consists of a young bunch of four entrepreneurs and investment bankers. iii) SolarTown Energy Solutions – SolarTown Energy Solutions engages in the sale, lease, and installation of solar rooftop systems for residential, commercial and industrial customers. The company has an experience of over 100 installations and an impressive corporate customer base. iv) Firstgreen – Firstgreen engages in the installation of solar rooftop system at your roof without any burdens of financing, permissions or operation of the solar rooftop system yourself. The company also arranges finance through banks and third party companies. Will these companies make it large? Well, we have to wait and watch. Readers can add on to the list by commenting on the post. I am a land owner and have every type of land suitable for Creating clean energy via Solar plants and components. Please help me find a good Solar Company to whom I can give my land on lease as well work with a joint venture project in Jamnagar city of Gujarat. I have Residential Rooftop space,Commercial Space,Industrial Space and agriculture land as well.